Manny Pacquiao a Filipino boxer and 8-division title champion was promoted to Lieutenant Colonel in Philippine Army reserved forces. 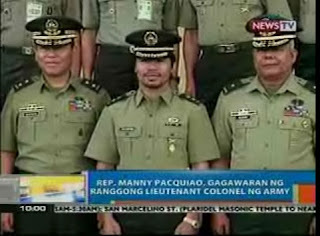 The Army donned the lieutenant colonel rank to champion boxer and reservist and Sarangani representative Manny Pacquiao in simple ceremonies in Fort Bonifacio, Taguig today, Monday, December 5, 2011. 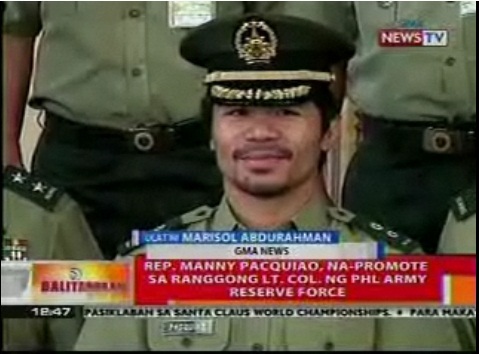 Pacquiao earned the rank of Lieutenant Colonel in the Armed Forces of the Philippines Reserve force last September. 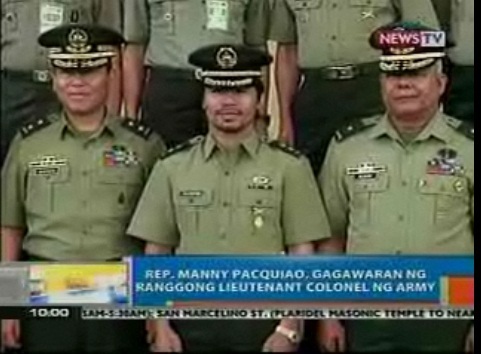 Manny Pacquiao, also a Sarangani Congressman, was promoted to the rank of Master Sergeant on October 7, 2007, was elevated to the rank of Senior Master Sergeant on May 4, 2009. 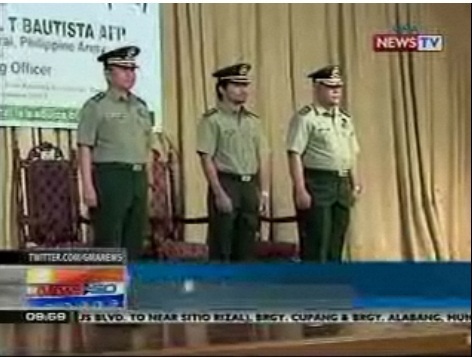 Lt. Col. Manny Pacquiao earned his rank last September, and his papers were signed by Executive Secretary Pacquito Ochoa on the authority of President Benigno Aquino III (PNoy), who is also the military’s commander in chief. 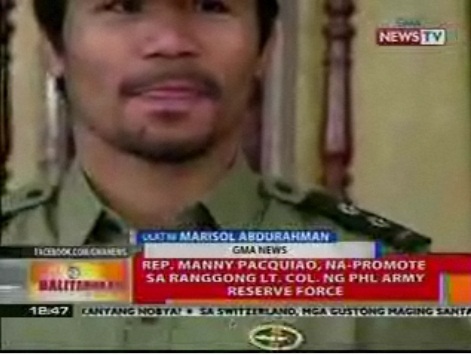 Pacquiao applied for his commissionship to Lieutenant Colonel last June 27, 2011. The commissioning of Pacquiao as Lieutenant Colonel took effect last September 21, 2011 and his promotion was recommended by Army Chief Lt. Gen. Ortiz based on the endorsement of his subordinates. 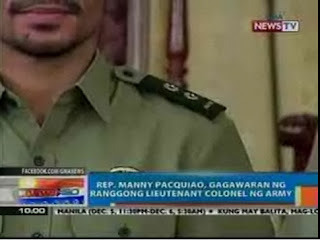 Presidential spokesperson Edwin Lacierda said Pacquiao is entitled to his rank being an elected representative incorporated into the reserved force of the Philippine Army. 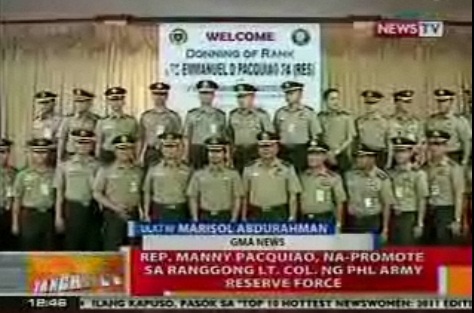 Section 44 of Republic Act 7077 states that election officials and presidential appointees may be commissioned into the reserve force subject to existing AFP rules and regulations. 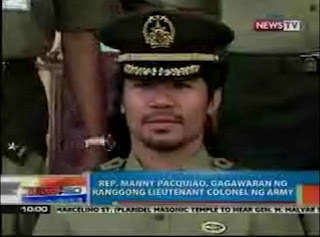 Manny Pacquiao had an honorary doctorate degree on humanities as conferred by the Southwestern University in Cebu on Feb. 18, 2009. As a newly-appointed Lieutenant Colonel, Pacquiao will also be designated as the Battalion Executive Officer of the 1st Sarangani Ready Reserve Battalion, and will be serving under the command of Colonel Gregorio Warren Manilay. Ranks like this have been given in the past to other personalities in the government, especially those who have achieved feats or great achievements like Manny Pacquiao. shall be confirmed by Congress. 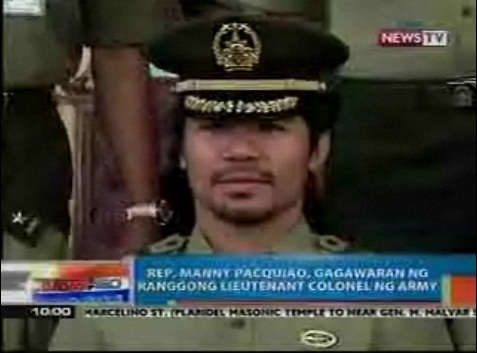 CONGRATULATIONS Lieutenant Colonel EMMANUEL "MANNY" PACQUIAO!